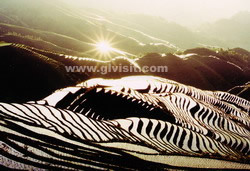 Depart from your hotel after breakfast in the morning and drive 29 km to the southern suburb of Guilin. The Crown Cave locates in the Caoping Hui Nationality village by Li River. The landscape arround the cave is excellent and the inside world of the cave is so beautifull and unique. It is a giant subterranean river system on the east side of the Li River. It has been set with a sightseeing elevator, small trains, sampans and sightseeing roller coasters, and thus receive the honour of Guinness world record for the most numerous ways of touring a cave. The cave extends 12km, but only the 3km nearest the river has been explored to any large extent. The cave is protected by scheduled closures to protect its unique qualities from crowds and other inadvertent damages. Stalagmites abound inside the cave making grotesque and imposing shapes that lead people into a fairyland. The deepest spot is over 10 meters. Crown Cave Wonderland It is also possible to enjoy a leisurely rafting experience after visiting this enchanting cave. Gudong Waterfall Groups Gudong Waterfall Groups is the only one waterfall group formed by underground water (spring) in China and it also locates in a forestry scenic Area. The water of the waterfall is clear and clean. 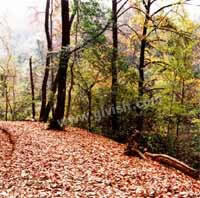 The forest area covers about 1000 acres and features primitive forest areas. The ancient trees grow extremely high. Red maple is attractive. 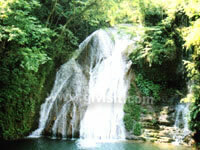 It is the closest waterfall to the city and also a good place for mountain climbers and hikers.